Aron in game: 7,441 Who? Important notice! Pokemon Aron is a fictional character of humans. Aron (Japanese: ココドラ Cokodora) is a dual-type Steel/Rock Pokémon introduced in Generation III. 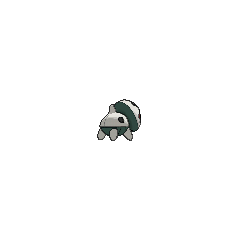 It evolves into Lairon starting at level 32, which evolves into Aggron starting at level 42. 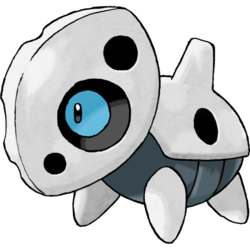 Aron is a quadruped Pokémon with four stubby legs and a large round head. Its body is black with plates of gray armor covering its head, back, and legs. Throughout its body are small openings in the armor. There are six openings on its head, with the largest two being openings for its pale blue eyes, and one opening on either side of the spike on its back. A single, blunt spike protrudes from its back. Aron feeds on iron ore that it digs from mountains. It uses this ore to make its body. Sometimes hunger will drive it to descend from the mountains to eat bridges and rails, which makes it a pest. It makes a new suit of armor after evolving, while its old discarded armor is salvaged for making iron products. With one all-out charge, it can demolish even a heavy dump truck. It lives on mountains. Aron first appeared in A Hole Lotta Trouble. Ash, May, Max, Brock and Team Rocket got themselves lost in a cave full of the Iron Armor Pokémon. Steven, who also owns one, helped them pass through the cave. An Aron appeared in Gone Corphishin' in a fantasy. Aron, together with its evolutionary family Aggron and Lairon, appeared in Giratina and the Sky Warrior where they helped Ash's friends stop the glacier. The group appeared again in the credits, where they were seen eating the ruins of the Megarig. An Aron appeared in Steeling Peace of Mind! and several Aron appeared in Saving the World From Ruins! A group of Aron also appeared in Genesect and the Legend Awakened at Pokémon Hills. An Aron appeared in SS027. A Trainer's Aron appeared in a picture in Origins of Mega Evolution!. 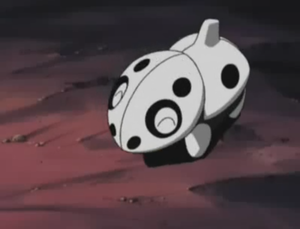 An Aron made a brief appearance in Mega Evolution Special II. AG022 Aron Ash's Pokédex Aron, the Iron Armor Pokémon. 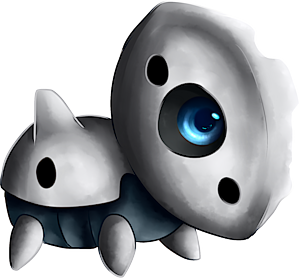 Aron has an impressive defense power and eats iron ore in order to build up the metal in its body. Sapphire owns an Aron nicknamed Rono, who evolved before facing Brawly at the Dewford Gym, and after a long stay in her team during which it fought Team Aqua a few times, evolved on Mirage Island as she trained with Ruby there. It was her first Pokémon. Pokémon Pinball: Ruby & Sapphire: The EVO Mode banner features an Aron. Aron has a body of steel. With one all-out charge, this Pokémon can demolish even a heavy dump truck. The destroyed dump truck then becomes a handy meal for the Pokémon. A Pokémon that is clad in steel armor. A new suit of armor is made when it evolves. The old, discarded armor is salvaged as metal for making iron products. It eats iron to build its steel body. It is a pest that descends from mountains to eat bridges and train tracks. When it evolves, it sheds the steel carapace that covered its whole body and develops a new one. In order to build up its steel body, it eats iron ore. This pesky Pokémon is known to eat railroad tracks. Moves marked with a superscript game abbreviation can only be bred onto Aron in that game. 51%-100% HP I grow big on a diet of iron! Level up I leveled up! I wish I had more iron to eat! It rams with its iron head to attack. It launches an iron ball to attack. Aron often plays in the Cavern Zone. He adores iron. He'll happily eat anything made out of iron! 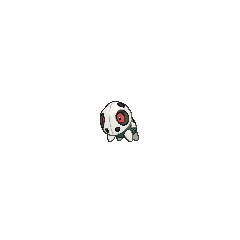 For other sprites and images, please see Aron images on the Bulbagarden Archives. Aron may be based on the Pulgasari, a monster that eats iron in Korean legend. Aron may be a combination of armor and iron. It may also involve armadillo. Cokodora is a combination of 子 ko (child) and Kodora (Lairon's Japanese name). Kodora may be a combination of 巨 ko (large) and dragon. Japanese ココドラ Cokodora From 子 ko and dragon. Can also be taken as "Little Kodora"